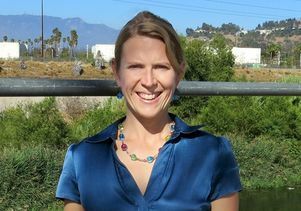 Allison Carruth, associate professor of English in the UCLA College, was selected as the 2019–2020 Anschutz Distinguished Fellow by the American studies program at Princeton University. Created in 1997, the fellowship was designed to annually bring a leading scholar to Princeton for one semester, with the goal of widening American studies. As a fellow, Carruth will teach an upper-division multidisciplinary seminar course for undergraduates and deliver a public lecture to faculty, graduate students and interested members of the community. Carruth’s interests include contemporary environmental narrative, media and art. She is the Waldo W. Neikirk Chair for undergraduate education innovation and the director of the UCLA Laboratory for Environmental Narrative Strategies.